Sled dogs are a hearty breed of animals. They have very thick fur and amazing stamina. 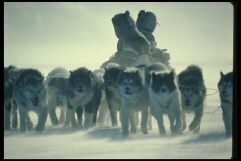 A team of dogs can pull a sled and a person for hundreds of miles. The Iditarod (external link!) is the most popular sled dog race. Taking place in early spring, the Iditarod starts in downtown Anchorage, which is in the taiga. 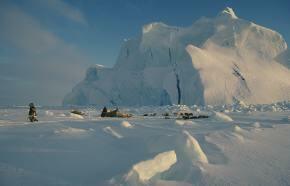 The race end and ends 1049 miles later in the tundra of Nome, Alaska. Can you imagine traveling 1049 miles powered only by dogs! The race takes one to two weeks to complete. 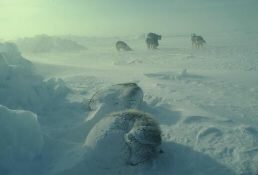 These smart dogs know how to adapt to the frigid conditions in the taiga and tundra. Here the dogs curl themselves up to protect from the harsh wind. The dogs must mush and work as a team in order to survive.